Living with A-Fib has taught Natalee to be grateful for the body she has. My story starts in March, 2016. On March 13, I went off on my first training bike ride for IM CDA 70.3 in July but didn’t get far. I crashed my bicycle taking a corner at 20 mph in the pouring rain and across some train tracks. I broke my collarbone in 2 places although no surgery was needed. I also had a concussion. My helmet has 7 cracks all the way through it. Exactly one week later, I woke up in the middle of the night with severe pain down my left arm, the one in a sling, and got up to get some meds. I looked at the clock to see the time and then passed out. Ten minutes later, I woke up on the floor,and my heart was racing and skipping a lot. I was living alone at the time, and I called 911 and the ambulance took me to the hospital. They said I was in A-Fib, and it took a few hours for them to cardiovert me medicinally. That was my first encounter with A-Fib. 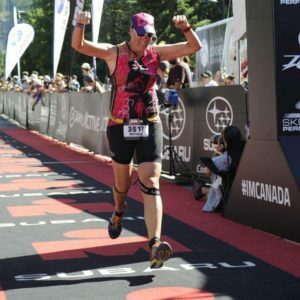 I have had many more spells of A-Fib, and it has slowed me down in a half marathon and most recently in the half marathon portion of my 70.3 at IM Canada, but it hasn’t stopped me. Living with A-Fib has taught me to slow down a little but also makes me even more grateful for the body I have and the life I get to live with pushing it to its limits from time to time. Three months after my diagnosis, my father was also diagnosed with A-Fib. With the blessing from our doctors, we trained together and did a 220 mile bike ride from Seattle to Portland together in July 2016 with “Team A-Fib” on our shirts. We went slowly and stayed together. I found Ironheart through an ad for the recent documentary, HEART: Flatline to Finish Line, and am excited to be part of such an understanding and like-minded group.